So after an incredibly frustrating month of waiting in Australia for my resident permit I have finally arrived in Ljubljana, Slovenia. I’m Bess, I am 20 years old and doing exchange here in Ljubljana at the Faculty of Economics for 2 semesters. 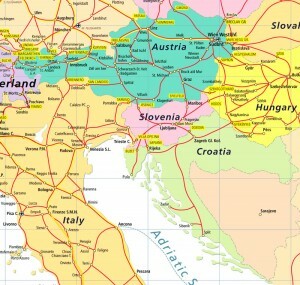 Most people’s line of questioning when I tell them where I’m doing exchange is firstly, ‘Where is Slovenia?’ (see map below), and secondly, ‘Why Slovenia?’. I feel that the question really should be why not? I originally was all set to go to the UK but decided I really wanted to do exchange for a year and this ruled out most of the UK and America. So, I decided to look at all the places offered by QUT and not rule out anywhere, and I’m really glad I did! A little bit of background about Slovenia and Ljubljana [lyoob-lyAH-nah]. Slovenia has a population slightly over 2 million people. It was formerly part of Yugoslavia but became independent over ten years ago and has since become a member of the European Union. It uses the Euro as currency and has its own language ‘Slovenian’. It borders the Julian Alps to the north and the Adriatic sea to the south, so it has Continental, Mediterranean and Alpine climates all in the one country. Ljubljana has close to 300 000 inhabitants, and over 60 000 of these inhabitants are uni students, making it a really young city. Ljubljana is said to mean ‘beloved’ and is quite often compared to fairytales, due in part to the castle up on a big hill looking down at the city. It is one of the 4 finalists for the European Green Capital 2015 Award and is a very safe, picturesque city with lots of green spaces, beautiful old buildings and very friendly people. But one of the major factors for why I chose Ljubljana is that it is set in a great position in Europe. It is only a couple of hours away from Venice and Vienna and many other cities are easily accessible from here. I have been here almost 2 weeks now and apart from the cold and the snow, which is unheard of this late into spring, I am really enjoying it here! I don’t speak any Slovenian, apart from the phrase ‘do you speak English?’ and so far I haven’t had any trouble. I missed about 4 weeks of classes and also the orientation week (I was late receiving my resident permit) but have caught up and settled in. My classes here are in English and aren’t too strenuous or don’t expect too much so that is always a bonus. I will say that the country is quite administrative, so I had quite a bit to organise during the first few days/week. Usually everything would be explained and taken care of during the orientation week, but I managed easily enough. Before you arrive in Ljubljana the uni here provides you with a really large amount of helpful. Additionally, every exchange student is assigned a ‘tutor’, which is basically a Slovene student who is available to help you out with anything, particularly anything that might require some native language. Also, the international office here is amazing, they provided me with all the information I needed, a free sim card, a bus map with which buses I needed to take and a city map with places I needed to know marked. So that is most of what I have to say to introduce Ljubljana, I will be posting more about accommodation and other things that might be helpful to know soon. But one thing I want to say is if you are considering doing exchange, don’t be afraid to look into some of the places you hadn’t considered yet. Most of the exchange partners offer classes in English and although it may seem daunting you might read about somewhere and decide it is a perfect fit for what you are looking for. Thanks heaps Hannah! I hope you have been really enjoying your exchange. Bess I have loved reading your blog, what an unbelievable experience and opportunity for you. You go girl! Please keep me up to date when you can. Mum and Dad must be pretty proud of you doing this. Hello there! I just want to offer you a big thumbs up for your great information you’ve got right here on this post. I will be returning to your blog for more soon.